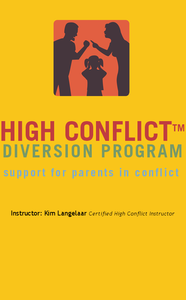 This program was developed by Brooke Olsen founder of the High Conflict Diversion Program. Note: Parents do not attend this class on the same day. Classes offered to Parents on opposite days. A certificate is issued reflecting completion of the program. We recommend you reserve your space early. Limited to 10 adults per class. You may also complete the course privately at your convenience. Cost for individual instruction is $125 a session. You will be required to attend 5 two hours sessions.